"Someone is needed alongside the CEO that understands the total changes in technology that are changing customer behavior." Phil Fersht (HfS Research): Bill, with our next client summit dreamSource coming up in two months, the number one topic on the agenda that enterprise buyers have voted to talk about is "how to shift the corporate leadership mindset away from merely cost control to one of value creation". Someone once said the definition of insanity is talking about the same problem in many different ways and always arriving at the same conclusion. How can we break this cycle, and is this something that you have seen with any of your clients? Bill Payne (IBM Global Services): This change in mindset can often involve a change of thinking at the top, and in some ways, I use that as evidence of why we do not have a chief customer officer. If you have everyone on the board of directors owning the customer, no one truly owns the customer. No one is truly driving the customer/consumer strategy. The CEO has a huge role in that, but in my view, you need someone with a different point of view, someone who really understands the change in generational behavior, change in technology, change in social, and actually injecting the organization with controversy and the reality around how the world is changing. I am not sure I see that in a lot of companies that they get it. We have recently seen a major UK retailer go bust, Comet Group. It had been doing well for many years, but one of the biggest drags to their development is that once they had ecommerce, it was not integrated with their bricks and mortar. Their customers rejected it because of the confusion between the costing and pricing on the website vs. stores, and their staff was not trained across the different platforms. It is a sharp reminder of the pitfalls of not integrating across all channels quickly. What I see from an IBM perspective and from my space is that we are increasingly having sessions with customers about end to end. No longer are they thinking contact center, no longer are they thinking CRM system, no longer are they thinking speech to text analytics. There are senior people saying: can you paint me a picture, show me a vision of the consumer end to end, and tell me how that can be deployed? Now, where we are seeing that? I have to say in emerging markets, such as Brazil and the Far East. Newer organizations are basically saying, we have to do the design, build, and operate model and we have to get to an integrated solution very quickly. They say we know what our customers want, and if we do not get there, someone else will, and they are going to take away a big piece of our market. That’s the revenue growth piece. Phil Fersht: Working for a big provider like an IBM, in your ideal world, how can you really help clients and, in reality, what is more achievable for businesess that might be 10 years behind the curve? What is the engagement model and how should it look in your mind? Bill Payne: The engagement model is changing. In my part of the business, we have a large portfolio of customers in the front, middle, and back office. Very often the discussion would be for a piece of that: can you run our contact center? Can you provide us with outbound notification? We have a number of very large opportunities that are coming through our door and have been having very good discussions with senior level executives about an end-to-end omni-channel fully integrated single view of the customer, using data to drive insight, using data to drive revenue across sell/cross-sell, and designing, building, and rolling that out quickly, while fully outsourcing that capacity, but doing it on a transaction or outcomes basis. Engaging with a customer about IBM sharing the risk and the upside when driving revenue up is a very different commercial model. We are beginning to see a number of significantly large opportunities in this end-to-end play and not just picking up pieces of the customers state. Phil Fersht: Bill, you talk about outcomes and risk sharing? Can you share an example or two about how this can - and is - working in practice? Bill Payne: I can share both can and how. It is always difficult to map this out. Phil, you and I have both been in this business long enough to know that this risk reward discussion has been going on for a decade now, and there are a number of winners and losers. I think what we are seeing is something different. As we move our model towards transactions and outcome, and if you are involved in a full omni-channel deployment with customer data for say a retail customer, it is easier then to commercialize and amortize the design and build to share both the cost and the revenue as the business grows. Should the business shrink, then one needs to be able to wind down some of the infrastructure. You need to truly variabilize that cost. What we are seeing with some of the more modern tools and software from IBM and partner's technology is the ability to commercialize a deal in a different way with easier integration of customer data. It’s not all about throwing away everything you have and re-platforming a new CRM system, it can simply be around integrating data into the face of the customer. The true driver here is that IBM will come around and propose it, design it, build it, and operate it. The idea is to then make the cost variable such that it is variable on the number of customers or volume of transactions within the system and that then rides on a revenue going up, which is what we want to happen, but should it come down, the cost to operate the system will come down as well. We've got some deals working very well like that. Those discussions are naturally not easy for executives and can take some negotiation. But I think it is something that we are seeing more and more. In particular as a lot of organizations are potentially short on investment money, they need to move quickly and cannot afford not to do design, build, and operate in one step. I think we are able to utilize our big international and finance systems to drive those kinds of projects. Phil Fersht: Let's talk finally about analytics. We have written a lot about this recently, where the world is short on "data scientists" and overloaded with office workers. When I look at an area like customer centricity, there are a lot of niche analytics providers in this space who will provide archiving and interpretation of data. Based on this conversation, analytics is really only useful if you are able to tie it into the whole customer value chain. So, is this the central value of using an IBM as opposed to a niche provider is that you get someone who can actually put it all together and who can look at the big picture? Bill Payne: Let me try and give you an example of this. As we head towards the heart of the American football season, when we look at the stats of the American football team, we can look at the attack and the defense stats. They are of course very interesting, but are completely uninteresting when you compare them to the winning ratio of the team. So, what this tells you is that you can look at individual pieces of statistical information and draw one conclusion, but it is only when you bring it all together that you can draw the full conclusion. So, I think there is absolutely use in looking at individual stats as one piece of the organization, but what is beginning to happen is that a single view of the customer center is absolutely back on the agenda. For a number of years, companies rejected it, by single view you were suggesting a re-platforming of their CRM system for hundreds of millions of dollars. I think there are very different ways of doing this by drawing together customer information on how we behave on all of the different channels. We do not want to ring up a contact center and then have them not know we have been on their website or what we have been saying on social media. There is a need to integrate. The good news is that we have some great integration software. There are some really good niche providers, people like ourselves who integrate, and we have some of the tools, but we also use some of our partner's tools. So, one can use some of these analytics, such as text analytics or speech analytics in a way, but what I think we see in the next decade for sure is how they will get brought together in a much more synergistic way around the customer. When I am speaking to executives and they ask me, what do we do Bill? I will say design your new organization outside in, not inside out. So, outside in means look to where your customers are now and where they will be and then drive that back into you organization. Do not sit around a table designing your organization based on what you think is happening now inside your company, because I can guarantee it is going to change in the customer world in the next decade. Phil Fersht: And finally, what advice would you give to marketing executives today? Bill Payne: Take control of your brand, take control of the changes that are happening in your customer market, understand your customers needs, integrate them, and create a new customer experience. Phil Fersht: Bill, its been great having you back on here - am sure our readers will appreciate your insights. 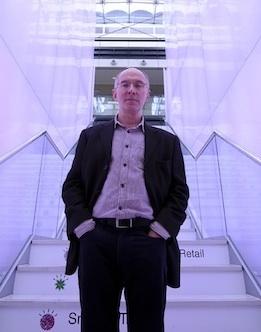 Bill Payne (pictured above) is VP for Global CRM and Industries at IBM Global Services. He is a 25-year industry veteran where he has held wide ranging responsibilities in the Consulting, Business Services and Outsourcing sectors across Europe, US and Asia. He is well-known on the European speaking circuit and is also an Honorary Professor at Lancaster University Management School.